BIOZUCCO DISTRIBUCIONES SL. which has been a worldwide distribution and Trade Company for organic food in Andalusia, Spain for more than 15 years now. We have our own trademark named ESLAVECO. Our business philosophy is based on environmental consciousness in the export and import for wholesale, retail trade and for industrial processing. To do justice to the high demands of our customers we exclusively offer high-quality ecologically grown farm products, mainly fresh organic fruits and vegetables. 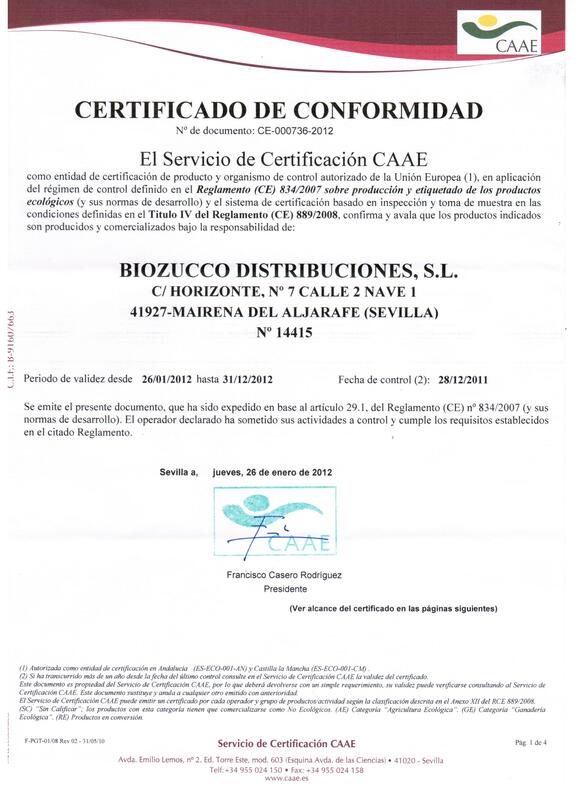 All our goods are sent with the bio-certificate documentation and the ecological seal of the ASOCIACION CAAE (ASOCIACION COMITE ANDALUZ DE AGRICULTURA ECOLOGICA). The C.A.A.E is a control board and auditor for ecological agriculture and the most important organic food certifier in Andalusia, South Spain. (Listed www.organic-bio.com under Asociación CAAE). We are actually working on our online-shop where you can order other organic products. For further information about our terms of business, pricing, product types, packaging, formats etc. please do not hesitate to contact us. We should appreciate the opportunity of showing you how efficiently we can serve you.